BuildyourwritinglifeFood for thoughtIndulgeinwritingInformation for new writers. 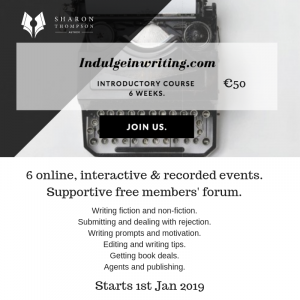 #Indulgeinwriting Online Writing Group for 2019. Plans are afoot for #Indulgeinwriting for 2019. 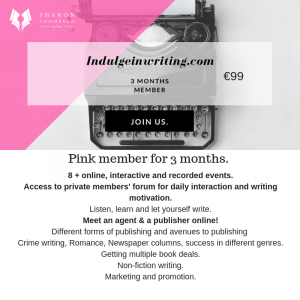 For those of you who haven’t seen me go on about it on social media, #Indulgeinwriting is my online writing group. 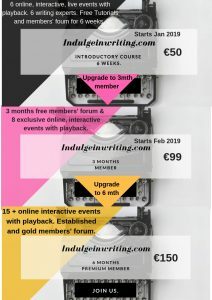 I’m excited by the new format of three membership levels for 2019. I’m not ‘into’ hard selling. 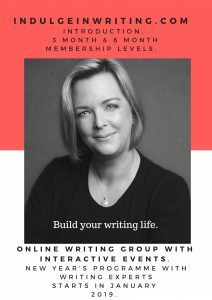 I simply hope that people who wish to write will join our group and that I can pay myself and my expert guest-hosts a small fee for their time. I’ve started an Introduction membership for 6 weeks starting Jan 1st. A 3 month membership and 6 month membership will both start on Feb 1st. With a novel launching on 22nd January, I think I am rather brave! However, the 30+ online events are planned and pencilled into a calendar. 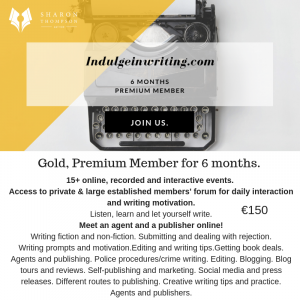 2018 Indulgeinwriting members have been an absolute joy to work with. Many have gone on to pitch their work in competitions and to agents and publishers. Some simply share their writing on the private forums and get support/encouragement with tips and advice thrown in. Their confidence and knowledge is growing from listening to the experts on the online, recorded and interactive events. I love my #Indulgeinwriting group. It is a welcoming, safe place which I monitor daily. Interactive events happen most weeks. It’s fun and we indulge in writing! Check out Indulgeinwriting.com for all of the details.